Click on images for expanded views! A hard Cayenne backing with intense heat supplied by ample Ghost and Carolina Reaper peppers. It has a wonderful flavor profile and enough heat to "hurt your feelings." Requested by and made for those folks who like their heat a bit on the "extreme" side of the spectrum. !! Our newest product - launched 9-24-2018 !! 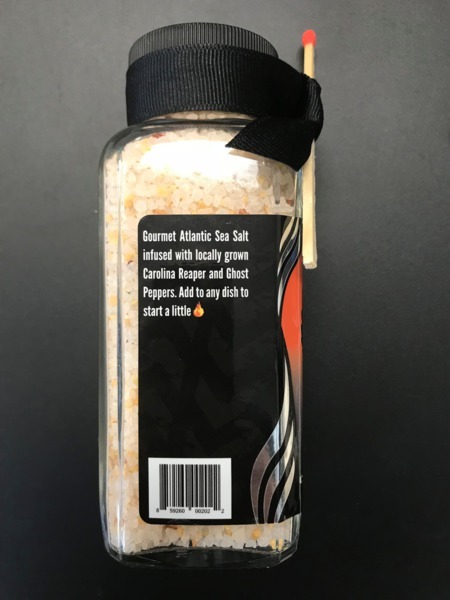 Gourmet Atlantic Sea Salt infused with locally grown Carolina Reaper and Ghost Peppers. Can be used to add some fire to any dish! 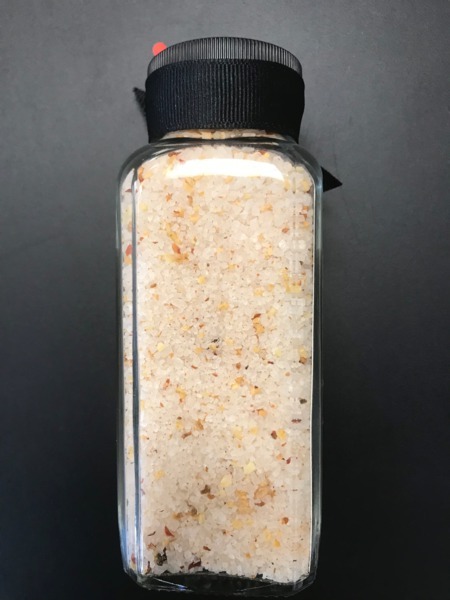 Use it in soups, stews, on meats, fish, chicken prior/during cooking or as a super finishing salt! 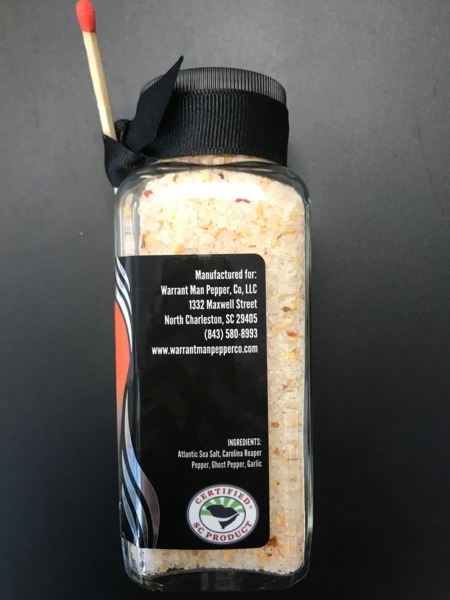 This is one flavorful vinegar infusion with great spicing and just enough Carolina Reaper pepper to get your attention! Clearly Guilty is the perfect compliment for greens, stews and soups... We are constantly getting advised by our customers on new uses for this unique product. Discover your own favorite way to enjoy! Fan inspired sauce made with a unique blending of exotic "super hot" peppers.. This sauce packs heat enough for the most discerning of palettes and is quickly becoming a favorite with hot sauce lovers everywhere. This is a sauce bursting with bold flavor and meant to be eaten. Homicide is as good as hot sauce gets! This is the mid-range heat product. It has the highest variety of peppers and tends to be the most popular. A delicious all around sauce that can be enjoyed on many foods. Excellent on wings! This season's batch of Scotch Bonnet peppers came in a bit scoville high, so fans of this blend may find it a little hotter than usual..
Each bottle comes with a miniature handcuff keepsake! Our sauces are made with fresh peppers that are hand picked at the peak of ripeness to ensure the best quality product. No artificial colors nor any chemical additives. Using great ingredients produces great sauce! Our Carolina Reaper peppers are actually grown in South Carolina. This pepper indeed holds the world's record with having a heat range of 1.5 million to 2.2 million Scoville heat units. Click on image to learn more! Whenever possible we use locally grown ingredients from the Carolina lowcountry. John's Island tomatoes are the best! Quality control is a primary concern with our gourmet sauces. Using the Carolina Reaper as our "base" pepper, we have discovered that although we maintain an exacting recipe, the "heat" levels of the peppers do vary. The "flavor" of each sauce will always be consistent, however the "heat" of each may differ from batch to batch. We have yet to overcome this issue of volatility. We are grateful to our fans who stuck with us while this "hobby" became a business! We appreciate the support and hope you enjoy our products.